The Indigo-winged Parrot (Hapalopsittaca fuertesi) population numbers only 160. Outcomes: The team was able to locate 14 birds to begin with, and subsequent surveys and intensive conservation action have boosted the wild population to 160. It is protected in Acaime and Cañon del Quindío Natural Reserves. An area of 631 ha of core habitat was recently acquired by Fundación ProAves with the support of various organizations. Another 300 ha area, the Giles-Fuertesi Bird Reserve located in Cajamarca, was also recently created. Research in this area will center on the species' habitat use, behaviour and reproduction, with the ongoing use of nest boxes, which have been very successful in increasing breeding success. More boxes will be constructed to provide enough sites to allow success to continue, and reduce competition from other species. Environmental education programmes are also being utilized to spread awareness in local communities. Where found: In Cordillera Central, below Nevado de Santa Isabel, W Colombia. History: The Indigo-winged Parrot lives only on the west slope of the Central Andes of Colombia near the border of Quindío, Risaralda and Tolima. The last known sighting of the species was in 1911. The species was rediscovered by Fundación ProAves in mountain forest in Génova municipality, Quindío Department. In July 2002, the first confirmed sighting was made in the central Andes, close to Los Nevados National Park, when 14 birds were located in a small area of forest (Parr and Gilardi 2002). Intensive conservation and protection efforts have boosted the population to 160, thanks to a 87% hatching success and 95% fledging success amongst breeding birds in the Central Cordillera (Anon 2006). 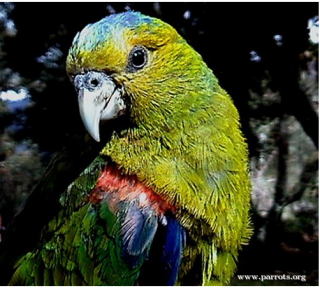 Ecology: The habits of this parrot are poorly known, but research undertaken since 2003 has revealed some information on the species' breeding and feeding ecology. It tends to inhabit cloud-forest betweeen 2600 and 3600m, and is known to require mistletoe berries as a food source. Nesting takes place between January and May.